A guy has received all series of death threats after he posted the photo of his girlfriend on his Instagram page…check on it! 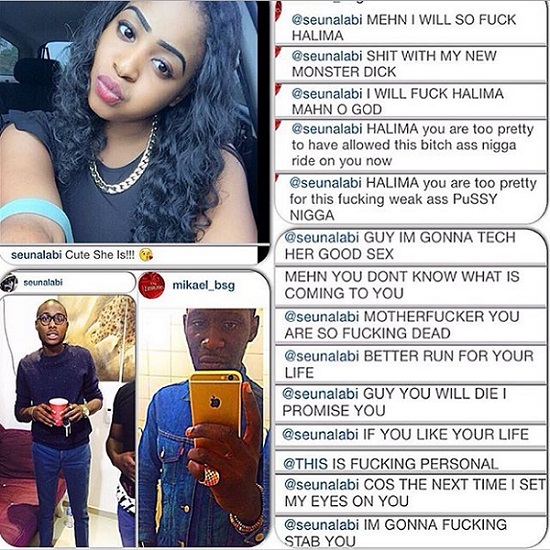 Seun Alabi posted the picture of his girlfriend, Halima some days ago. But today, a guy who goes by the name, Micheal Ehindero, stormed his page to threaten his life. The Michael threatens Seun saying he wants to do several unprintable things to Halima, which leaves one questioning the sanity of this nuisance. A check on Micheal’s page shows that Seun isn’t the only person he has been threatening. He also often boasts of his family name, Ehindero, which is the same as the surname of former police IG Sunday Ehindero.